Retired July 1, 1948. Died October 3, 1965. 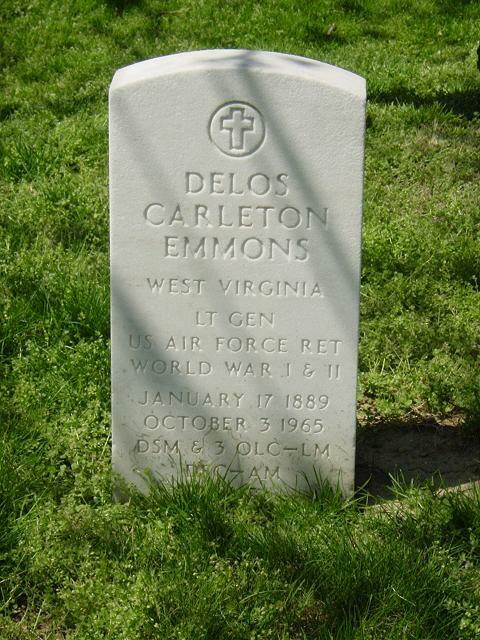 Delos Carleton Emmons was born in 1888 in Huntingdon, West Virginia. He graduated from the U.S. Military Academy in June 1909 and was commissioned a Second Lieutenant of Infantry. Emmons was assigned as commanding officer of Company B, 30th Infantry at Presidio in San Francisco and in May 1912 went to Fort Gibbon, Alaska with the 30th. He returned to Plattsburg Barracks, New York. He became a First Lieutenant in July 1916 and was detailed to the Signal Corps' Aviation Section for pilot training in August 1916. He was rated a junior military aviator in May 1917 and became a Captain in July. Emmons next served as aeronautical officer of the Western Department at San Francisco and in December went to Washington as assistant executive in the Office of the Chief Signal Officer. The following June Emmons became a major and went to Mather Field, Calif. He became a lieutenant colonel in August and in December was transferred to McCook Field in Dayton, Ohio as assistant chief of the Engineering Division. Emmons transferred to the Air Service in July 1920 and a year later completed the Air Service Course at Harvard University. He returned to McCook Field for three years as chief of Production Engineering. Emmons went to Crissy Field, California, in August 1924 where he served as commanding officer of the field, and then to Rockwell Field as commanding officer of the 91st Observation Squadron. He went to Washington, D.C., in August 1927 as executive officer for the chief of the Air Corps. He held the same assignment for the assistant secretary of war for air in October 1928. Emmons graduated from the Air Corps Tactical School at Maxwell Air Force Base, Alabama, and the Command and General Staff School at Fort Leavenworth, Kansas. Emmons was commanding officer and air officer of the 18th Composite Wing and the Hawaiian Department at Fort Shafter in the Hawaiian Islands from March 1934 to July 1936. He became a colonel in March 1935. Colonel Emmons returned to the United States in July 1936 as commander of the 1st Wing at March Field, California. He had been promoted to Brigadier General the previous month. Emmons received his second star in March 1939 while commanding general of Headquarters Air Force at Langley Field, Virginia. After the fall of France the Americans and British increased their military cooperation; Emmons was one of three American military observers sent to London August 6, 1940. He was promoted to Lieutenant General in November and became chief of the Air Force Combat Command in June 1941. General Emmons returned to Hawaii as commanding general of the Hawaiian Department December 17, 10 days after Pearl Harbor. He requested Army Air Force Headquarters to send additional planes and received them as rapidly as possible. Emmons built up the forces in Hawaii, anticipating the battle of Midway. Returning to the United States in June 1943 Emmons was assigned three months later as commanding general of the Western Defense Command at Presidio, San Francisco. Emmons headed the Alaskan Department at Fort Richardson from June 1944 until June 1946. He became commandant of the Armed Forces Staff College at Norfolk, Virginia, in August 1946 and remained in that position until he retired June 30, 1948. General Emmons' awards and decorations include the Distinguished Service Medal with two oak leaf clusters; Legion of Merit; Legion of Merit (Navy); Distinguished Flying Cross Air Medal; American Defense Service Medal with Foreign Service Clasp; American Campaign Medal; Asiatic-Pacific Campaign Medal with Bronze Star; World War I Victory Medal; World War II Victory Medal; Mexican Border Service Medal.